Choreographers are people of such imagination and vision. Each creator’s drive, concerns vary from each other & from time to time. Inspired by personal, creative, intuitive, technical input each composition takes shape. I for one aspire to reach a realm where I can create and watch my own ‘unforgettable extraordinary theatrical experience’. And this target set the backdrop for my next-a surreal masked entity. When you start a new piece of creation, you address several questions looking for fitting answers. In the end, I’m not sure if the questions are answered but it definitely leaves you with the next set of questions to respond. a) About engaging with other human beings not with mere delight of bodily movement but the viewing and experience of the dance. b) To retain, recreate & relive the beauty & exoticism built upon our art practices over the years. Using influences of the orient the work designs individuals into one narrative: Of a king, who sets eyes on extending the horizon of his kingdom, sets to sail on the quest but fate takes him on an unexpected journey of betrayal. The music of this piece has something very innately universal that it strikes a chord with every person. It had all the qualities – royalty of a kingdom, the grandeur of a king, the hint of an impending doom – that are vital to this choreography. To add to its beauty were the perfect pauses of silence which accentuated the dance. Needless to say that this dance choreography has been inspired from the music, resulting in a union of the two. With that in place, I focussed on my warriors viz the dancers of the piece. The piece had larger than life Kathakali inspired fluorescent masks to adorn and dance with. So, the dancers had to absorb two processes: with and without the mask. At studio, usually I like to start with a fresh image in mind and a great deal of trial and error. The form is arrived at after movements coming from the dancer’s bodies, from my body to theirs and mainly from the main thread of emotion holding the piece. This piece was especially difficult for the dancers since the usage of the masks meant they have to use their bodies to emote what the mask hid from the faces. Also, working on the stage’s geometry and developing a sixth sense of positions of fellow dancers was quite a task. To add to the trouble was the difficulty in breathing due to the masks. We began with a lot of breathing exercises to get rid of the breathing difficulty and the anxiety that the mask would entail. Also, additional focus was laid upon exercises with the dancer to understand how one puts feelings in the character with a mask on your face and utilize the body for emoting the ideas. Making of the Kathakali masks was one of my favourite parts of this piece. After pouring over references of masks from almost all possible places in India, we settled on the Kathakali look. Contemporizing the mask was a fun task. It was a new learning experience working with the designer, pouring over different versions of the mask, finalising the look, the colour, the texture, the proportion of the size. 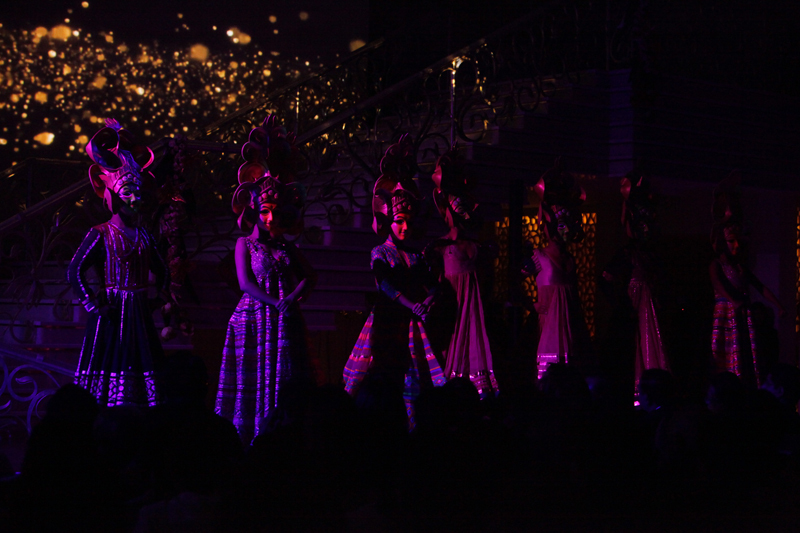 And this entire piece was taken to new heights with the use of UV lights and gorgeously designed costumes by the designer duo Abu Jani – Sandeep Khosla. Like all pieces, it will grow with time; mature. And who knows, at some point in future, I might just extend it. Our work is shaped by our curiosity – challenging the ordinary, embracing the known, and exploring the unknown. Boasting of a deep connection with our roots, our dance explores varying degrees of human capacities, cultures and connections. Creating thoughtful experiences through their dance, Nritarutya is the storyteller of modern India expanding the frontiers of tradition and art. © Copyright 2017. Nritarutya. All rights reserved.